If there’s one thing better than free food in NYC, where a cup of coffee will set you back five bucks, it’s free rent. Barring that, we’d have to go with free ice cream. What a way to welcome the rising temps and sunny weather, right? It’s also the perfect way to celebrate a birthday, and that’s exactly what Milk & Cream Cereal Bar is doing tomorrow. In case you’re not (yet!) familiar, Milk & Cream Cereal Bar is the dessert shop that dishes up plays on that old childhood favorite: cereal. Hit either of their two locations in NYC (Nolita and Gansevoort Market) and you won’t think of cereal as just a breakfast food anymore — and you might just feel like a kid again. They’ve been dishing up dreamy desserts like ice cream milkshakes and ice cream swirls blended with beloved cereals for a whole year now. And that’s where the free food in NYC comes in. They want to celebrate their first anniversary with you, and they clearly understand the value of free food in NYC. The first 200 customers in each of their locations tomorrow -- that’s Thursday, May 3 — will get a free ice cream swirl. And we’re not talking about that classic swirl cone you get from any old dessert shop. They mean ice cream blended with a cereal of your choice, doused generously with some delicious toppings. So how do I take advantage of this deal for free food in NYC? 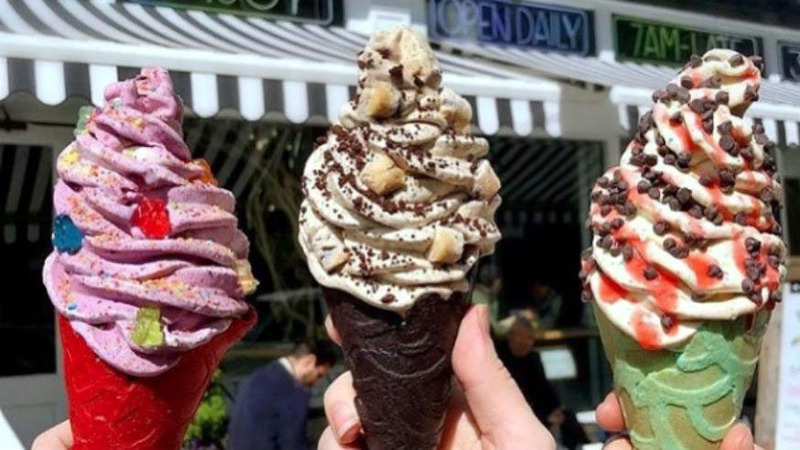 To get in on the ice cream goodness, you’ll need to download a voucher from their website. You can go to this page about the deal, which described the dessert they’re dishing up as well as the rules involved. Click on the button for the location of their shop you’re planning on hitting tomorrow, Thursday, May 3. That will take you to an EventBrite page where you’ll register for a voucher to get in on the free ice cream deal. At the time of publication, vouchers were only available for their Gansevoort Market location, so get to the site and get yours stat. Then, with the sunshine on your face and a song in your heart, head down to the location listed on your voucher tomorrow. Present it to the Milk & Cream Cereal Bar staffer who helps you out, and dream up the most delicious combination you can think of. Oh, and singing them Happy Birthday doesn’t count as their tip.